Prof. Chen's research focuses on the dynamics and air-sea interactions in tropical convection, tropical cyclones/hurricanes, and intraseasonal oscillations. Prof. Chen leads a research group at UW that has developed a new generation fully coupled atmosphere-wave-ocean model known as the Unified Wave INterface-Coupled Model (UWIN-CM) for coastal and hurricane research and prediction. 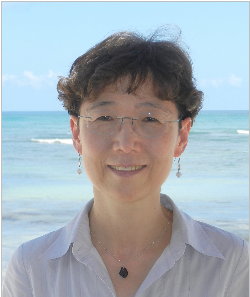 Prof. Chen has been a lead scientist on several global tropical cyclone research programs, among them: The Coupled Boundary Layer Air-Sea Transfer (CBLAST) experiment; the Hurricane Rainband And INtensity Change EXperiment (RAINEX) using three Doppler radar aircraft collecting unprecedented in-situ data in Hurricanes Katrina, Rita, and Ophelia in 2005; and Impact of Typhoons on Ocean in the Pacific (ITOP) in 2010--the largest international program to study typhoons in the West Pacific. She was also a lead aircraft scientist in the DYNamics of the Madden-Julian Oscillation (DYNAMO) field campaign in 2011 collecting data over the Indian Ocean to improve our knowledge of the Madden-Julian Oscillation (MJO) and its impacts on global weather. Her research group is also working with scientists and engineers at the National Renewable Energy Lab (NREL) on offshore wind energy modeling. She is currently working with a team of scientists focusing on understanding the impact of oil spill on the environment in the Gulf of Mexico including realtime UWIN-CM prediction during the Grand LAgrangian Drifters (GLAD) in 2012 and the Surfzone and Coastal Oil Pathways Experiment (SCOPE) in 2013.